Bulana Inga is an award winning designer based in St Petersburg. Bulana’s extensive education started in Art College, completed in 2003. She obtained a Garment Technology degree from the State College of Technology and Design in Ufa, Russia before graduating with a degree in Fashion Design in 2015 from St Petersburg State University of Technology and Design. After trying her hand in both menswear and childrenswear, Inga naturally gravitated towards womenswear, which she focused her brand on. 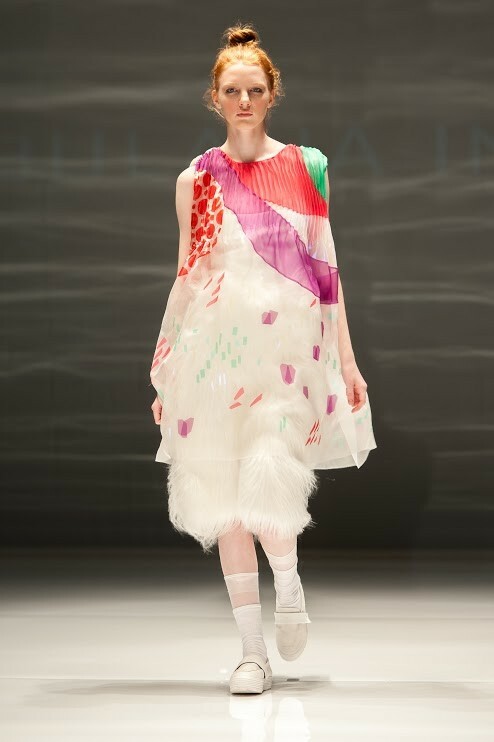 Despite being newly established, Bulana Inga showed her collection to a critical acclaim at St Peterburg Fashion Week and in 2016 was invited to take part in Greater Donhua Fashion Week in Shanghai and Graduate Fashion Week in London. She became a winner of several international competitions. Having strong technical knowledge behind her, Bulana playfully experiments with textiles, mixing innovative, bold and delicate. The resulting designs are joyously colourful and dynamic.